MadeToPrint supports Enfocus’ FullSWITCH and PowerSWITCH workflow systems. In order to use MadeToPrint in combination with SWITCH, Adobe InDesign CS4 - CC and MadeToPrint Auto have to be installed on the same machine. The communication between SWITCH and MadeToPrint is realized by XML tickets, which are created by both systems and exchanged via hot folders. To setup this workflow users only have to configure and save MadeToPrint standard jobs, similar to the handling of the plug-in’s Standard version. All further settings have to be configured within SWITCH. MadeToPrint creates a text file, listing up all ready-to-use standard jobs, which is picked up and read by SWITCH. MadeToPrint Auto InDesign will automatically go into SWITCH mode in case the plug-in is addressed by SWITCH, further adjustments are not required. 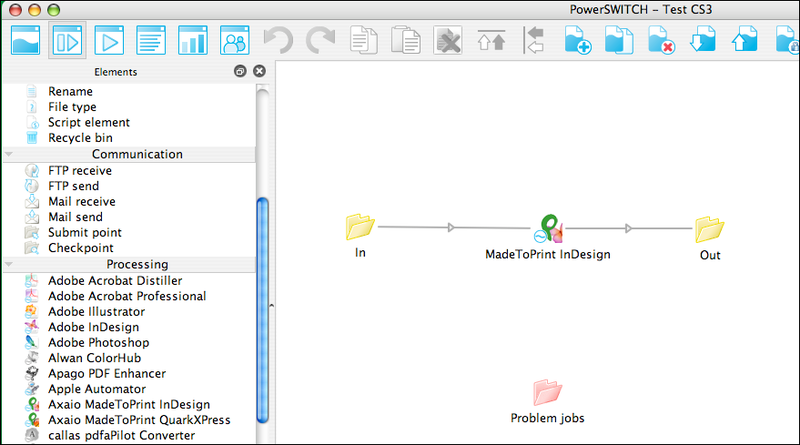 Having completed the job set up, MadeToPrint can be integrated into flows from within the SWITCH interface, by dragging the MadeToPrint InDesign configurator from the elements pane into a flow. For proper processing, the MadeToPrint configurator needs at least one ingoing and one outgoing folder. To complete the MadeToPrint flow you will have to pick a job from the exported list, which can be activated under MadeToPrint jobname and select from library. A popup window displays all available jobs. Moreover, jobs can also be determined flexibly by using variables (Define single-line text with Variables) and scripts. 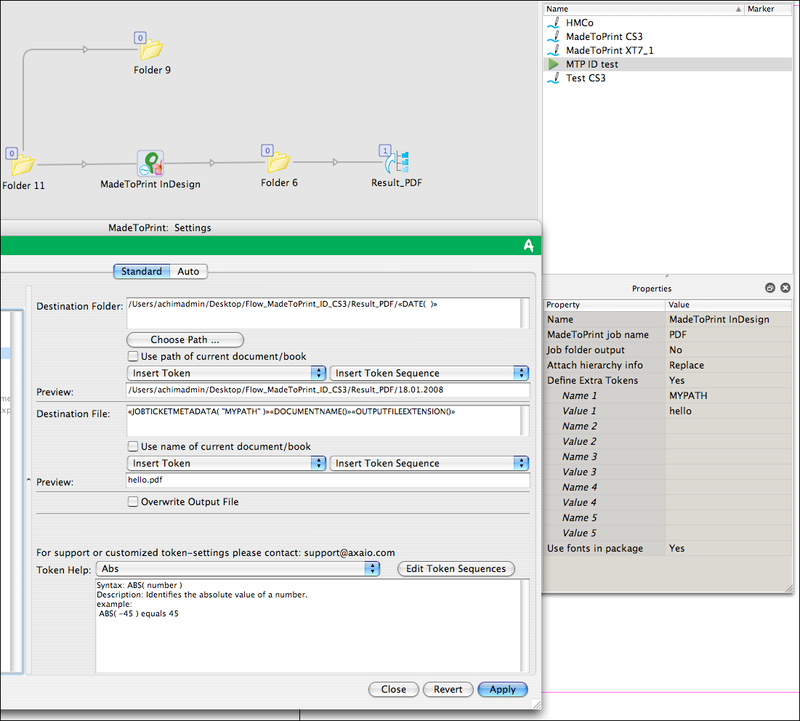 SWITCH and MadeToPrint provide options to transfer path and folder hierarchies from MadeToPrint to SWITCH. In case a document is processed through MadeToPrint, the result file can be saved either directly to the SWITCH out folder or it can submitted in a folder, carrying the same name as the result file. In order to get hold of the exact output path hierarchy determined inside a MadeToPrint job (under File Name and Destination folder), SWITCH offers three different settings options, all of them to be found under Attach hierarchy info. For transferring the hierarchy path, one of these options has to be activated and the Archive Hierarchy-configurator has to be connected to an out folder. Using this setup, the output file(s) will be produced together with the entire folder hierarchy. When used in conjunction with SWITCH, MadeToPrint can only output files within the limits of SWITCH flows. By choosing the menu entry Define Extra Tokens, MadeToPrint tokens can be utilized for adopting SWITCH metadata information. The proper token for this is Jobticket Metadata, which evaluates SWITCH based information for naming hierarchy paths, result files and/or infobars. The following shows how MadeToPrint will create a result file named “hello” by evaluating SWITCH metadata (“Name 1” and “Value 1”).